Escape the heat of summer and join us again for this annual series to enjoy free performances, artist demonstrations and more, every fourth Sunday of the summer. General admission is free all day*, so gather the whole family and come to the Heard Museum for cool fun that kids of all ages will enjoy. Performance times: 12:30 p.m. and 2 p.m.
Derrick Suwaima Davis is a Native Arizonan, from the Hopi and Choctaw Nations. Davis’s love of dance began when he was just 3 years old when he first began to participate in Pow Wows. Davis is most famously known as the Seven Time World Champion Hoop Dancer. Visit with Marilou Schultz (Diné) and learn about Navajo (Diné) textile weaving! Marilou is famous for her exquisite traditional Germantown and Regional Styles rug patterns. Marilou only employs very fine hand spun, natural vegetal dyed wool. Rykelle is a metalshmith, jewler, printmaker and mixed media artist and will be demonstrating her jewelry making techniques with visitors. Did you know that you need sheep to make wool? Come and learn the steps it takes to create beautify colors of wool that is then used to weave beautiful weavings with! Join education staff in creating a cotton ball sheep to take home! Come take a seat and relax as you hear the story of Geraldine, a goat from Window Rock and her best friend and weaver Glenmae as they weave a rug together. 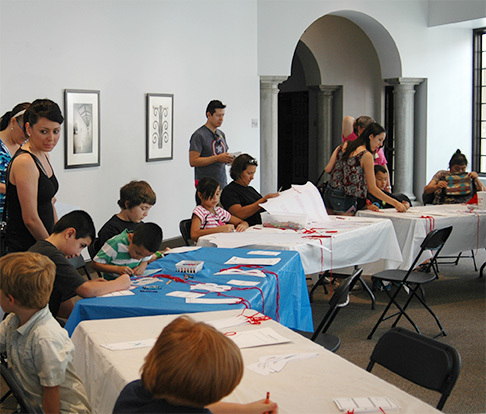 Make Frida and Diego-themed art projects in our kid-friendly exhibition It’s Your Turn: Frida y Diego. Palettas Betty will be selling home-made fruit and cream ice pops throughout the day. *Note: Admission to First Fridays and Summer Sundays does not include gate fees for the exhibition Frida Kahlo & Diego Rivera. Event attendees who wish to visit this special exhibition will be charged the gate fee of $7. Admission to the exhibition closes at 4:30 p.m. The museum remains open until 5 p.m.